Take excellent care of your drone with this Bower 4-in-1 Essentials kit. 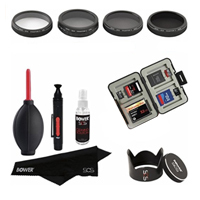 This professional filter kit has four different camera lens filters, a lens cap and hood set and a cleaning set, giving you everything you need to keep your drone in top condition. This Bower 4-in-1 Essentials kit fits the Phantom 3 and Phantom 4.